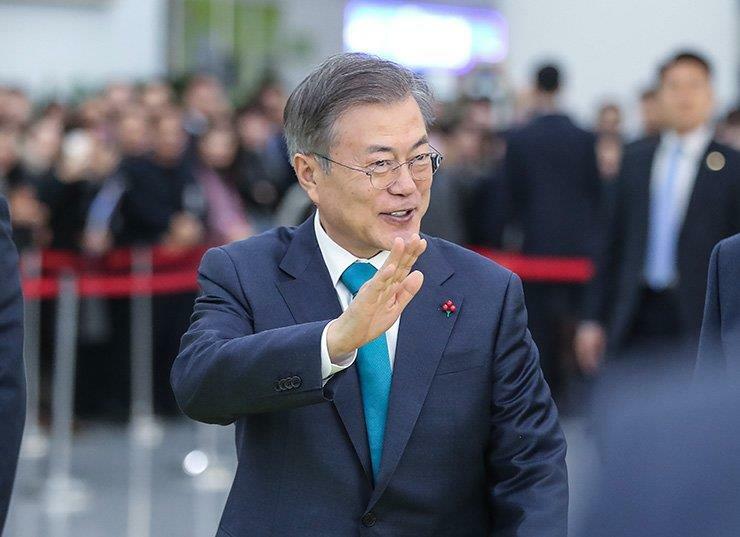 SEOUL, March 22 (Xinhua) -- South Korean President Moon Jae-in's approval rating rose this week after he ordered a thorough probe into past corruptions involving influential figures, a weekly poll showed Friday. According to the Gallup Korea poll, support for Moon added 1 percentage point over the week to 45 percent this week. Negative assessment on Moon's management of state affairs declined 2 percentage points to 44 percent. The results were based on a survey of 1,002 voters conducted from Tuesday to Thursday. It had plus and minus 3.1 percentage points in margin of error with a 95 percent confidence level. The support rate hike came after Moon ordered police and prosecutors earlier this week to thoroughly investigate past corruption cases, involving a former vice justice minister and the heads of an influential local newspaper. Moon's ruling Democratic Party maintained its top post in support scores with 37 percent of approval rating. It was followed by the main conservative opposition Liberty Korea Party with 21 percent of support rate. The minor progressive Justice Party won 9 percent of support this week, up 2 percentage points from the previous week. The minor conservative Bareun Future Party and the center-left Party for Democracy and Peace garnered 7 percent and 1 percent each in approval scores.